The night they hauled old Dixie down…? In your dreams, Barack. And that goes for you too, Bill and Hillary, and all the other Beltway “liberal” control freaks. The American left is in a feeding frenzy, cynically exploiting the tragic murders of nine black worshippers in a Charleston church to promote its agenda of cultural genocide against conservatism, tradition and the South. The liberals feel they are on a roll, having trashed states’ rights by railroading compulsory acceptance of homosexual marriage through the Supreme Court. Now, they feel, is the time to airbrush out of history every tradition that is an obstacle to their new, rootless, alien society based on intolerant political correctness. The epitome of everything they detest and fear is the Confederate Flag, so that is now the target of a hate campaign so fanatical and irrational as to seem barely sane. A White House spokesman said last week that President Obama has maintained for years that the Confederate flag “should be taken down and placed in a museum where it belongs”. Some members of Congress are also demanding the removal from beneath the Capitol dome of several statues of Confederate leaders, including Jefferson Davis, the president of the Confederacy. The dean of Washington National Cathedral has called for two stained glass windows that depict the Confederate flag to be replaced. If Jefferson Davis’s statue is “divisive”, will they also demolish the Lincoln Memorial celebrating his opponent? Further afield, Mayor Mitch Landrieu of New Orleans has called for a debate over the future of a statue in the city of Robert E. Lee and the renaming of a roundabout called Lee Circle to “reflect who we are as a people”. National retailers such as Walmart, Amazon, Sears, eBay and Etsy have rushed to remove items featuring the Confederate flag from their websites, though Walmart made a cake decorated with the Isil jihadist flag when a man who had been refused a cake with a Confederate flag requested it. While your supporters are trashing the monuments and reputations of the forefathers of so many Americans, Barack, you might just want to remind us again which state of the Union, north or south, your ancestors resided in during the traumatic years 1861- 1865? Or did Kenya not have a dog in that fight? The Confederacy was not a callous conspiracy to enforce slavery, but a patriotic and idealistic cause for which 490,000 men were killed, wounded or taken captive. The Civil War was not fought over slavery, but in defence of states’ rights. As for secession, the very existence of the United States derived from its secession from the British Crown. Why did the South, then, not have the right to secede in turn from a Union grown intolerable to it, with Abraham Lincoln assuming the role of George III? The attempt to demonise Robert E. Lee, a great gentleman and Christian soldier, is obscene. Lee was more critical of slavery than were the Northern generals Ulysses S. Grant and William Tecumseh Sherman. In a letter to his wife on 27 December 1856, which he could not have imagined anyone else would ever see, Lee wrote that “slavery as an institution, is a moral & political evil in any Country”. American liberals have just struck another blow against states’ rights by benefiting from the whim of just one “floating” Supreme Court justice to enforce homosexual marriage at federal level. When a supreme court is recognised as having a bloc of “liberal” judges – a partisan alignment more appropriate to a political assembly – neutral justice no longer exists. Everything that America deplores in Washington today is what the Confederacy fought against. 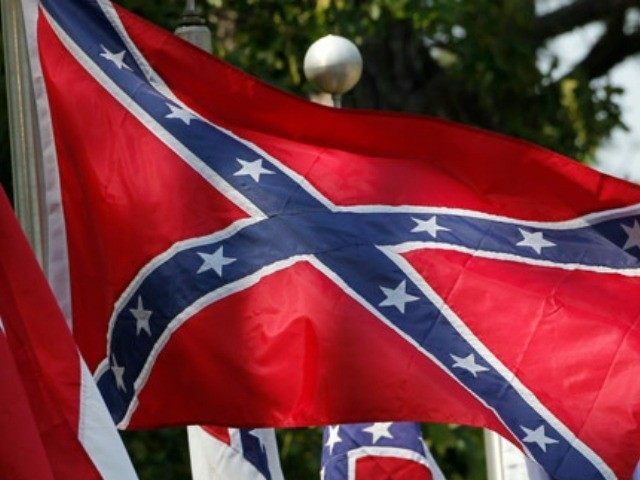 With a Republican governor pressing to remove the Confederate battle flag from the monument to the South’s dead sons in the South Carolina State House grounds, conservatives could be forgiven for despairing, not at the assaults from the enemy without, but at the treason of the RINOs within (Jeb Bush, too, has jumped on the anti-flag bandwagon). Weaklings are now routinely subverted by a false sense of guilt induced by liberal propaganda and media hype. But like their Marxist predecessors in the Soviet Union, the culture warriors of the left cannot be appeased by any concession: they rightly interpret it as weakness and demand more. Those who initiated identity politics are attempting to obliterate the Southern identity. There is only one response: defiance. Every tree, every rooftop, every picket fence, every telegraph pole in the South should be festooned with the Confederate battle flag. Hoist it high and fly it with pride, it proclaims a glorious heritage.